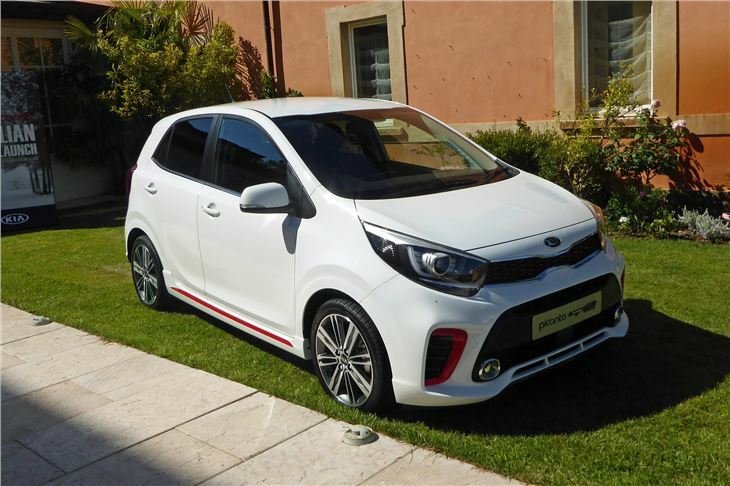 The 2017 KIA Picanto is a bit special. 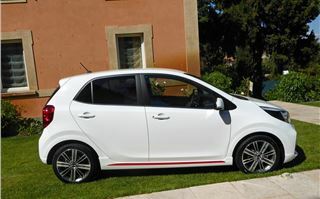 You think ho-hum, another tiny Korean car, and though the 2011 Picanto looked attractive it didn’t exactly get your pulse racing. The Hyundai i10 was always better to drive. It took just a few kilometres of twisting Italian roads to realise, from the passenger seat, that this one is a bit different. No need to ask the driver what the steering ‘feel’ was like as he flung the car into yet another switchback, grinning maniacally, having the time of his life. You can’t do that if the steering is dead and tyres don’t hang on like Gorilla glue. He was chucking it into the bends at ridiculous speeds, tyres screeching, utterly confident of what it was going to do. And this was the 69HP 998cc next-up-from base version on 14-inch wheels with 175/65 R14 tyres. Not supposed to be as much fun as a Mini Cooper was back in the 1960s. KIA has clearly turned a corner. So what have they done to make the car so good? 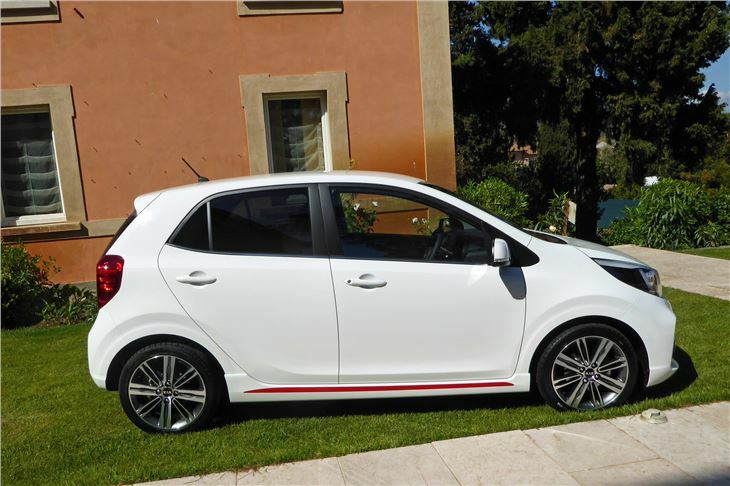 Partly a new electric motor assisted steering that replaces the rather dead and wooden system in the previous Picanto. And partly some clever rear suspension work. All little hatcbacks use variations of the ubiquitous trailing arms on coil springs connected by a twist beam. 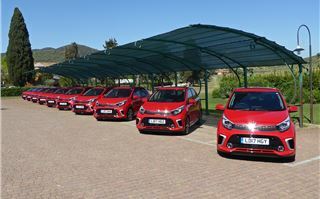 But what KIA seems to have done is extended the length of the training arms, giving the rear suspension more travel. So it steers better, it handles better, and it rides better. Why have I dwelled on this as if it’s the most important attribute of the car? Because it is. It transforms a practical little hatchback into a car that’s a pleasure to drive. Nothing else in the class comes close. Not the FIAT 500. Not the VW Up, SEAT Mii or Skoda Citigo. 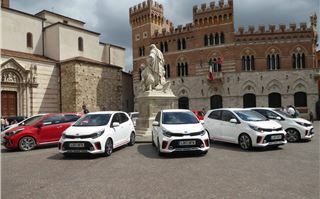 Not the Citroen C1, Peugeot 108 and Toyota Aygo. Not the Renault Twingo and Smart ForFour. And certainly not the Suzuki Celario and Vauxhall Viva. 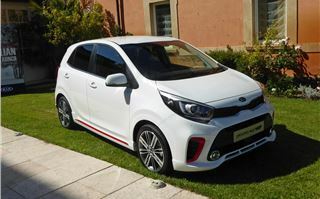 The little car that’s by far the most fun to drive is the 2017 KIA Picanto. It’s more practical, too. A longer wheelbase means more cabin space and a bigger boot that will now happily take two flight bags side by side. It has better seats, with plenty of support that give a decent driving position. The dash is clearly laid out, whether you go for the high spec GT Line S with integrated touch-screen Tom Tom satnav or the baser versions with just a radio. The door bins and bottle holders are a decent size. The glovebox is big enough to take the driver’s manual and plenty of other stuff. Everything works intuitively, leaving you to concentrate on your driving. As well as the 1.0 litre 3-cylinder little screamer there’s also a 1.25 4-cylinder boasting a whopping 85HP and slightly longer gearing in 5th. It doesn’t have the character of the 1.0 litre three, but it’s undoubtedly smoother with more torque and would be the choice if you regularly have distances to cover. The two 1.25s we drove were on 16-inch wheels with 195/45 R16 tyres that could have ruined it, but didn’t, even on some bumpy, broken surfaced Italian roads. Obviously a little less comfortable than the 175/65 R14s, but all right. 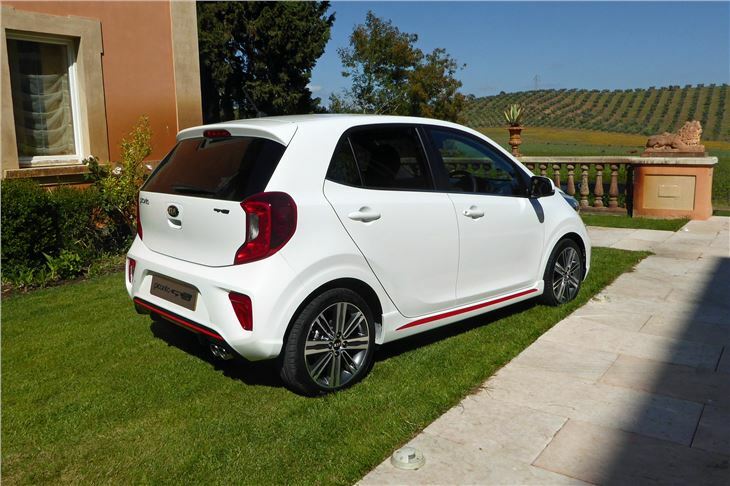 The in-between choice is a Picanto ‘3’ spec on 185/55 R15 tyres. All 2017 Picantos from ‘3’ spec up have an Advanced Driver Assistance Pack that includes autonomous emergency braking to stop you crashing into the backs of trucks or running over pedestrians. It’s an optional extra on ‘1’ specs and ‘2’ specs at £350. You can still get a 4-speed torque converter automatic if you need one. 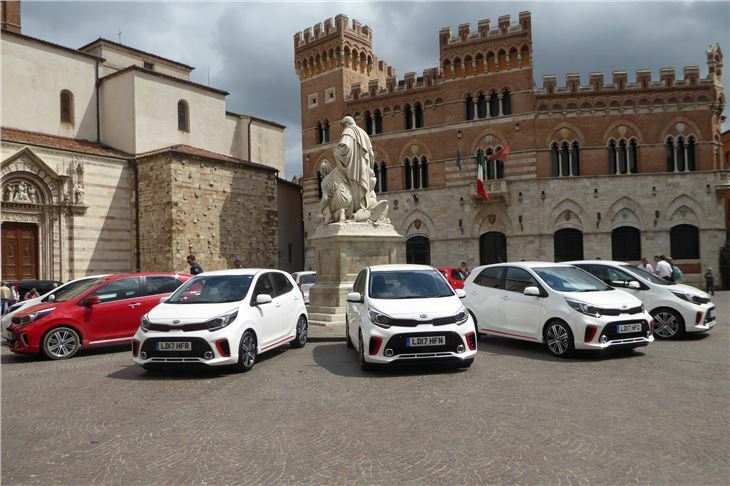 And, from late in 2017, you’ll be able to buy a Picanto with the same 100PS 998cc three-cylinder turbocharged engine that brightens up the KIA Rio. Grumbles? Not many, really. 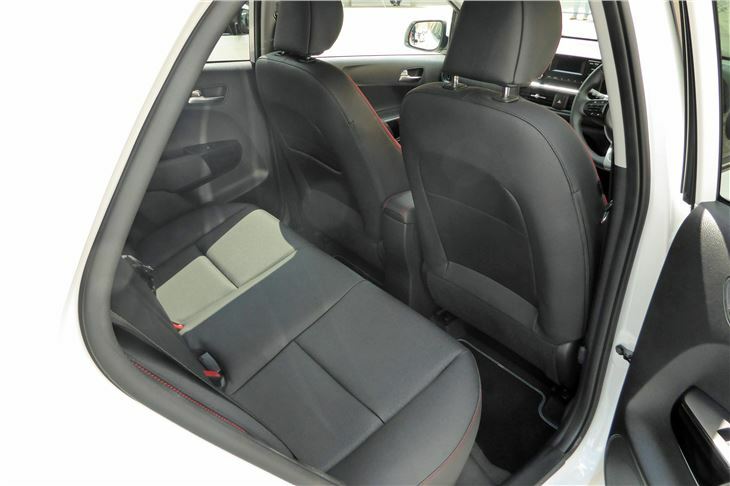 The rear seats don’t fold flat like they did on the original 2004 Picanto. (The seatbacks simply fold onto the cushions.) There’s no spare wheel: just a useless ‘tyre repair kit’, so best to join the AA and call them out with their universal emergency spare wheels if you get a puncture. 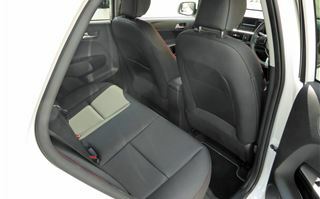 The driver’s seat does not adjust for height, but that’s a temporary aberration that will be sorted out in production. 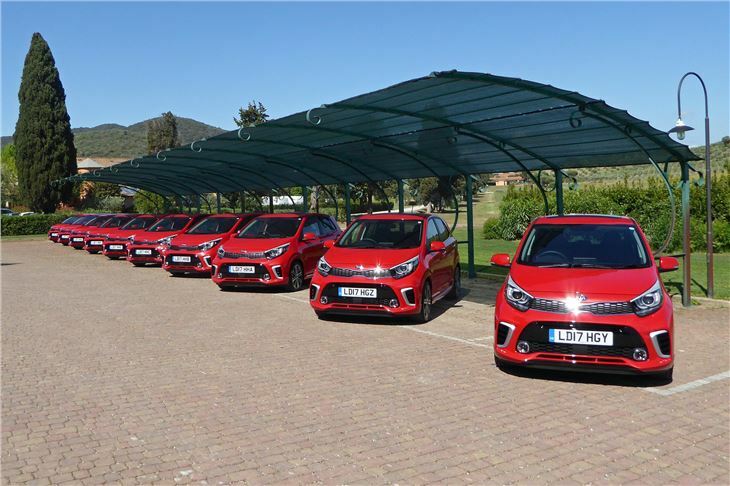 All Picantos sold in the UK come with KIA's seven-year, 100,000-mile warranty. It can’t have escaped KIA’s attention that in the UK at least, most young people considered the previous Picanto to be an oldies car. Not any longer once word starts to get around on Twitter, Facebook and You Tube. They’re gonna have fun, fun, fun ‘til their daddies take the keyfobs away.